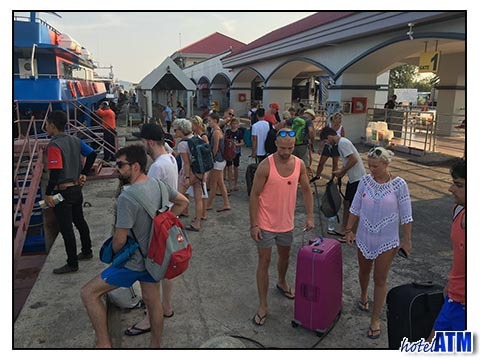 When you get a Phi Phi ferry you might be on Phi Phi, Phuket, Krabi, Koh Lanta, Koh Lipe or coming over from Koh Samui or the full moon party on Koh Phangan. This article helps you work out the ferry routes, connections and times as well as helps you make the booking. Every Phi Phi ferry ends up at the main pier at Phi Phi Don Village on Tonsai Bay. The pier is in a beautiful natural harbour surrounded by cliffs, beaches and coral reefs. The main pier is a hive of activity as it services the Phi Phi ferry boats from Phuket, Krabi and Koh Lanta as well as the sight seeing tours from Phuket, Krabi, the dive and tour boats of the island. The pier is busy with people but also goods and drinking water coming to and from the market. The normal Phi Phi ferry is long and thin designed to get people places quickly. As each year progresses, larger, more sea worthy ferries have been employed to carry their guests more comfortably, especially in the low season when there can be waves big waves. The Phi Phi ferry to Phuket in the morning departs 9.00 am and is used by local Phi Phi people going to market to return in the afternoon. Travellers trying to get a 13.00 pm flight from Phuket International Airport also use this ferry. The primary route for the Phi Phi ferry is from Phuket as day trippers come from the west coast beaches of Patong, Karon and Kata. The key attraction is time spent around Maya Bay as this is where Leonardo Di Caprio made his movie'The Beach'. These ferries leave Phuket at 08.30 in the morning and return from Phi Phi at 14.30. These are the largest ferries and the most comfortable. The Phi Phi ferry to Krabi is the main route for locals as Phi Phi is in Krabi Province and most of the government paperwork and banking gets done in Krabi Town. Krabi is the best way to leave Phi Phi during a storm as this route is going with the waves which are smaller than on the route Phi Phi to Phuket. The Ao Nang Princess is the Phi Phi ferry that gets tourists to Ao Nang Beach, Railay Beach, Noppharat Thara Beach, Ao Phra Nang Beach and Klong Muang Beach. These beaches have Krabi Province's best best luxury and best budget resorts. Here the striking and dazzling scenery eclipses that of Phi Phi. If you want to snorkel or dive stay on Phi Phi but if you need more above water scenery, Krabi province is something else. The Phi Phi ferry to Koh Lanta takes you to the closest land an hour away. Here you can enjoy some of the regions most delightful sunsets with the sun setting on Phi Phi Island, Koh Rok Nok, Koh Ha and Koh Ma. For a lot more detail on this route and how to get there during the low season when the ferry stops click Koh Lanta Ferry. The Phi Phi ferry to Koh Phangan is p[art of the monthly movement to celebrate the full moon party on Haad Rin. 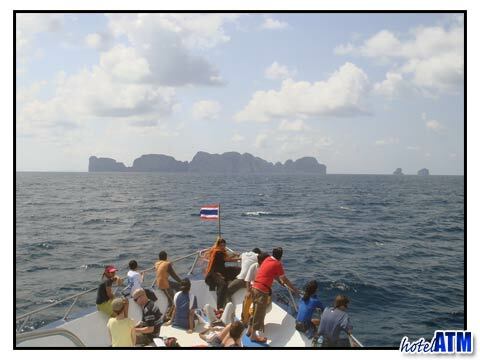 The ferry takes you over land via Krabi, Surat Thani and Samui or via Phuket Island and Phuket international Airport. To work out which way is best for you check out the informative Phi Phi to Koh Phangan article. Phi Phi ferry to Koh Lipe takes you on an exciting island hoping adventure to the 'Maldives of Thailand'. Going the whole way be boat jumping ferries along the way is for many one of the best sea journeys in Thailand. The ferries stop at Koh Lanta, Koh Ngai, Koh Muk, Trang Hat Yao Pier and Koh Laoliang before arriving at Koh Lipe and on the journey you will see dozens of islands, coral reefs cliffs and mangrove forests. More here; Phi Phi to Lipe.